Oh Yeah! Hair Accessories Galore! Some of the beautifully hand crafted pieces. It can be tricky for brides-to-be to know what kind of hair styles to go for and what hair accessories will suit them. 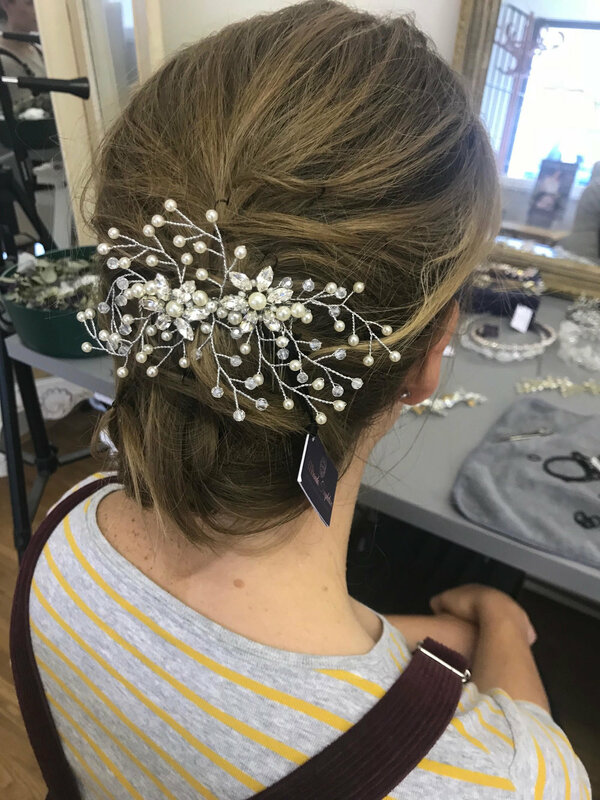 So we thought it would be a good idea to offer free 20 minute sessions for brides (first come, first serve) to have a chat with me about hair, to help them figure out what style suits them, their dress and their personality. I did a really quick demo of styles after a little chat and we tried on a range of accessories to suit. Doing it this way is useful because then you know that the hair style will suit the accessory. Whereas sometimes you may fall in love with a head piece or accessory and then find you are limited to the hair styles that it can be worn in. 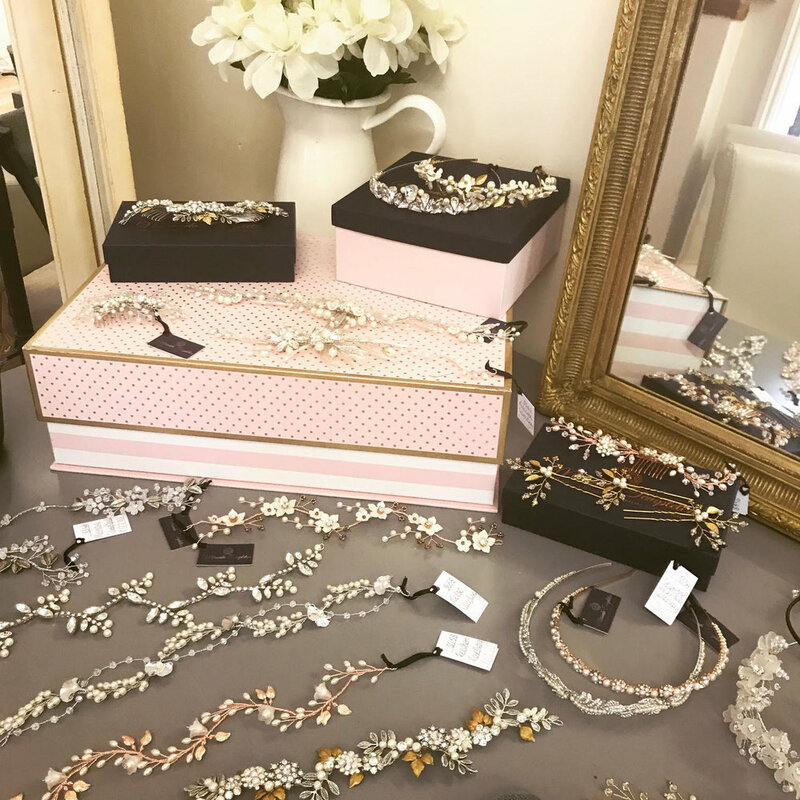 We had an extensive range of head pieces and accessories that are a good size for a bride, as you want it to be noticeable. There are delicate pieces, vintage styles and gorgeous jewel and pearl adorned designs to suit every bride. Each design can also come in silver, gold or rose gold and made to your preference which is AMAZING as we all love to customise things these days. Below are some of the head bands, which look great on a down style as well as up and the bands can be hidden, but if visible they have thin bands that tie in beautifully. A couple of the stunning head bands, I love the big chunky jewels! In each 20 minute session I was able to give the bride an idea of how their hair would work with the styles they liked, whether or not they might need hair extensions to bulk out the hair or not and see where a veil could go. They could also see my technique and feel confident that I would be able to achieve whatever they want on their big day. From looser styles to more formal classics. What do you think? I did not even use any hot tongs! If you are interested in coming to one of these days with me, then comment below or drop me an email: info@loloandco.uk and I can let you know when the next one will be. Hair and Makeup Know-How with Jen!